BBC 2 viewers living in Whitehaven, Cumbria will lose the channel tomorrow unless they immediately switch to a digital TV signal, as analogue transmissions to the town are being switched off in the morning. The airwave cull doesn’t stop at just one channel though, because the town and the surrounding area of Copeland also loses BBC 1, ITV 1 and Channel 4 analogue signals in a month's time, on 14 November – forcing around 25,000 residents to either switch to Freeview, buy Sky or... er... read a book. 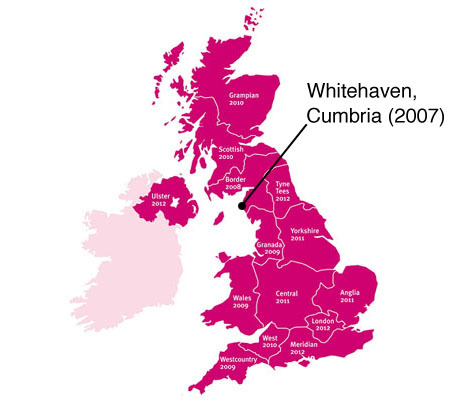 Digital UK, the Quango* created to manage the digital switchover, said that Whitehaven was chosen as the first British town to have its analogue feed cut because its geography means that it has a transmitter all to itself. Changing the signals there won’t interfere with neighbouring areas. Analogue TV signals across the rest of the country will have a phased switch-off between 2008 and 2012. For example, Yorkshire and London will have their analogue plugs pulled in 2011 and 2012, respectively. However, the Digital Switchover Supply Chain Group (DSSCG), which is backed by the likes of Comet and Sony, said last month it plans to phase out the manufacture and sale of analogue equipment long before the UK’s digital switchover is complete. So you could be forced to switch long before your analogue signal is gone.